Thanks Daniel for the Beta 3 deb. I took your suggestion and installed 15.0b3. All went well with just the message about Resolve requiring the the ligCg.and libCgGL version info. The splash screen and project manager screens open perfectly in the centre of the screen, but the main screen is off centre and cant be re-positioned. All the basics of the edit module seem to work, create bins, import media, timeline etc, but there are no minimize/maximize buttons. I have installed from a clean Ubuntu install a number of times. I'm not a Linux expert, and I'm a Resolver beginner, so I could be missing something obvious. I have read back on the topic and tried most of the previous suggestions. Nvidia 390 driver selected in Ubuntu. Neil Preston wrote: The splash screen and project manager screens open perfectly in the centre of the screen, but the main screen is off centre and cant be re-positioned. I've had similar issues before, not with Resolve specifically but with other programs. Try using the keyboard shortcuts for maximizing and restoring the Resolve window. Still no GPU support for Fusion in Resolve beta3. It is reproduceable by other users too. Sometimes I have the slight feeling that I should change to some other software, since I bought Licenses for DaVinci and Fusion its always a "waiting and hoping" to get some bugs fixed. They are kind of experimenting too much instead of going for stability. it would be also nice if they would tell their customers about their roadmap and goals. Can someone find what happens after this call? So i can try to at least find out what happens next. Anyone tried the new Nvidia 390.59 driver on Ubuntu? Boris Kovalev wrote: Can someone find what happens after this call? That's a little odd. I actually get the same reference even from a working system and there is no styles-directory included in the installer so that is probably normal. Looks like the most useful informational log message after that and before before SIGILL (illegal instruction) is "Updating display GPU information...". I suspect that something goes wrong when Resolve is gathering information about the GPU situation. This may be a driver and/or library issue. Do you have multiple GPU:s installed in your system? Such as a built in Intel Iris together with the Nvidia. If that is the case, try to disable/remove that other non-Nvidia GPU and uninstall any proprietary driver. What versions of the Nvidia packages do you have installed? (dpkg -l | grep nvidia) Do you perhaps have mixed packages from different Nvidia driver versions? Having audio support in v15 is great. 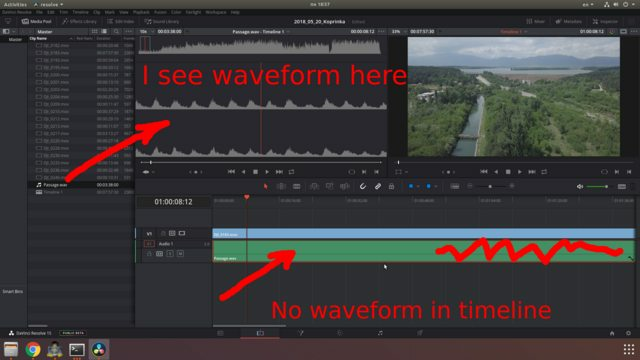 But how can I see the audio waveform in the timeline? I have a mp3 file that I had to convert to wav in order to get Davinci to "see" it in Media Manager. I have waveform there. But when I drag it to an Audio Track on my Timeline, I have no waveform there. Any clues how to get it displayed? If I double click on the track, I have the waveform loaded in the 1st preview box. But I prefer to have it in my timeline, to be able to align video transitions by it. I was wondering what happens next to the one i mentioned. What next few calls are, so i can guess where the problem could be. It's hard to debug using strace for me anyways, just running out of ideas by now. I am still unable to launch resolve, so can't see it by myself. Daniel Tufvesson wrote: Looks like the most useful informational log message after that and before before SIGILL (illegal instruction) is "Updating display GPU information...". I suspect that something goes wrong when Resolve is gathering information about the GPU situation. This may be a driver and/or library issue. Daniel Tufvesson wrote: What versions of the Nvidia packages do you have installed? (dpkg -l | grep nvidia) Do you perhaps have mixed packages from different Nvidia driver versions? Suddenly 14.3 works with your makeresolvedeb_14.3-2.sh Daniel. It's useless for me, as i only have onboard audio, but i can't get what the difference could be (14.3 vs 15.x). From the Beta forum, corroborating what's been suspected for a while. aidanryan wrote: I removed pocl.icd from /etc/OpenCL/vendors which had no effect. I also tried to remove mesa-libOpenCL, which was not installed. I then installed mesa-libOpenCL and removed all .icd files from /etc/OpenCL except nvidia.icd. This proved to be what allowed Resolve 15b3 to run on my particular Fedora 27 installation. It seems that OpenCL must be present on the machine, even if you intend to run Resolve using CUDA. BMD should fix it already. Sulo Kokki wrote: From the Beta forum, corroborating what's been suspected for a while. I only have mesa.icd and nvidia.icd in that folder, moving mesa.icd away has no effect. The package mesa-opencl-icd is installed, removing it has no effect. I think we may be on to something here. I was able to replicate this problem on my Debian 9 install by removing the package nvidia-opencl-icd. Installing nvidia-opencl-icd made Resolve happy again. Daniel Tufvesson wrote: I think we may be on to something here. I was able to replicate this problem on my Debian 9 install by removing the package nvidia-opencl-icd. Installing nvidia-opencl-icd made Resolve happy again. I have a similar experience with Linux Mint 18. After installing CUDA, Resolve failed to run. ocl-icd-opencl-dev got it started - on CUDA, as well. Getting identical message on Ubuntu 16.04, no nvidia card (using an old radeon 5450 - don't laugh, i just want to try it on a xeon cpu). installed manually from DaVinci_Resolve_15.0b3_Linux.sh with md5 cad9b9a4c989ce1eed15fbae2308927d (i also looked at the deb creation script but chose to do all steps manually). installation complained about missing /usr/lib64 which is missing in Ubuntu. will investigate when I have more time what exactly is trying to do/copy there. I had those libCg issues etc. Keep in mind that this script is also in it's beta stage. Removed b3 and installed b4, as per usual. It's a library for file transfers, so it should be a Studio version thing, one'd imagine. Otherwise, it should be included in /opt/resolve/libs. Sulo Kokki wrote: Removed b3 and installed b4, as per usual. Do you have libcurl installed? For Debian it's included in the libcurl3 package. Right, the problem was that Mint 18 uses Ubuntu 16.04LTS libs. This meant that the libcurl version supported by Xenial had become obsolete. I added a Bionic (18.04LTS) server to /etc/apt/sources.list, and then re-installed libcurl, updating it to the latest version. This made Resolve happy. As posted a few lines above, GPU support for Fusion tab is crashing on Resolve 15b4. Also tried with newest NVIDA 396.26 driver and updated Cuda. Sent crashlog to support. Someone else having the same issue? Marc, you’ve installed both the driver and the CUDA package? On Linux you should only need the driver as CUDA support is included inside the driver. Also, I don’t trust 290.56+ (I’m still on 390.48) as 396 is a ‘major’ revision designed to support CUDA 9.2 and 390.56 refuses to function for me. Try downgrading to 390.48 and see if that helps. I’m also running CentOS so YMMV. I’ll take a stab at B4 if I get a chance today. Using GPU on the Fusion page probably shouldn’t be recommended yet unless they’ve made some serious improvements to the OpenCL implementation. Noel Sterrett wrote: I've tried Ubuntu 16.04 and now also 17.10 with Resolve 14.2. Both work and are fine with the Decklink card. Neither work with the Mini Panel. The Mini Panel works with CentOS 7.4. For Ubuntu Newbies here, please explain in clear detail, what needs to be done in Ubuntu, regarding the above-referenced "lib64" before installing Resolve? The 'md _space_' reference is strange to me. What is that? Daniel Tufvesson wrote: My main concern here is the libDaVinciPanelAPI.so library which I'm not sure how it's used. My guess is that bmdpaneld or DaVinciPanelDaemon uses it somehow but it does not show up as a linked library using ldd. If we are unlucky, that file must still be placed in the /usr/lib64 path. I don't have a panel so I can not test this and I'm actually not very keen on buying one until I know it works. Aside that, you really use makeresolvedeb. Daniel Tufvesson wrote: Regarding system wide libraries affected by Resolve, there isn't that many really. The only libraries that are installed into the system library path /usr/lib64 by the original installer are the dvpanel libraries. All other libraries are installed into /opt/resolve/libs or /opt/resolve/bin. The dvpanel library package also contain avahi, libc++, libusb and libdns if I remember correctly. This may be okay for CentOS/RH but is not something I want to just copy into the system library path on another Linux distro such as Debian or Ubuntu. My script instead places these libraries into the /opt/resolve/bin directory to avoid corrupting the OS. Anyone running Debian or Ubuntu along with a panel and managed to get it working? @MikeRochefort: I tried on two computers, one with Ubuntu 16.04LTS, Nvidia 1060, tried with 390.30 and 396.26 driver. installed Cuda 9.2 with cuda patch. Second system with Ubuntu 17.10, Nvidia GeForce 960, 390.30 proprietary driver, Decklink Mini. It crashes on both systems. Did you tried to make the same move as described on your CentOS system and it does not crash ? Try installing on a fresh machine (regardless of version). Use the deb package. Install 390.48 (The official install PDF uses 390.42, but 48 is safe). Do not install the CUDA SDK package. See if that gets things working. @MikeRochefort: I dont have time for such games. I need a working system. What's the current status of Resolve 14.3 on Ubuntu 16.04? Is there a list of what's working, what's not, and how to install? I'm working to get Resolve on a few computers in a community Makerspace. Installed using the steps in the official Readme that came with the Linux download, but Resolve won't launch - it just flashes in the taskbar for a bit before vanishing. I'm trying to figure out whether it's worth my time trying to get it working on Linux, or whether I should nuke the machines and try to find the funding to get Windows for them. See the first post in this thread. Be advised, v14.3 does not support System Audio, whereas v15 betas do. Cheers! Sorry, totally should've checked that out. When people say that 'system audio' is broken, do they mean that we literally cannot hear audio during playback unless we have additional hardware? I'm having problems with sound support, no sound at all. I'm using v15.0b4 under Fedora 28 with NVIDIA GeForce GTX 1060 3GB. I've tried both with a regular headset connected to my internal sound card as well as a USB headset. Neither work. What I can see, is that in sound settings under fedora, as soon as DVR is started, there is an "ALSA plugin [resolve]" activated which seems fine, right? [0x7f1c1a1d7700] | IO.Audio | ERROR | 2018-05-30 23:48:52,789 | Failed to decode clip </home/santiago/gopro/100GOPRO/GOPR5690.mov>, track: 0, position: 4328160 - Failed to decode the audio samples. Yes. For Resolve 14.3 you would need a Decklink or monitor card for audio. Resolve 15 betas have support for Linux system audio so you can use your regular audio interface for monitoring. Latest beta is 15.0b4. I would recommend giving it a try! Since you are on Ubuntu the most straight forward way would be to use the Debian package creator (makeresolvedeb). Links are on the first post of the thread. Or you can check out my instructions here. Marc Gasser wrote: @MikeRochefort: I dont have time for such games. I need a working system. I guess then you should use a supported distribution..
that's at least the way, how i bridge the gap by help of nvidia-docker sandboxes on my debian testing system. it's just another experimental approach, but i will definitely do less harm do your existing environment than BMDs installer or questionable quick and dirty hacks. You should really work on your attitude. That's not a 'stupid boycott' but an economic decision from BMD. I guess you never ran you own business. I think we should be extremely grateful to blackmagicdesign for the free resolve and the very low priced resolve studio package! As a part time developer I'm deeply impressed by the ver 15 four betas, how much they've added and fixed in each one and how much of that directly covers 'complaints' and wishes on the forum!!! I now have an iMac 5k, an older MacBook Pro i7/nvidia, a linux Ubuntu Studio/Intel Xeon and a linux Ubuntu Studio/Amd Threadripper with fully (? working 15b4 !!! I really look forward to the resolve 15 stable, I think it will be a benchmark for the competition (who ever that is and a fantastic resource for video production! Some of the complaints on the forum are of course users in delivery stress with something they want to work on a platform that they have'nt tested enough before they use it in real production! it's more than implausible, to interpret this stubbornness as a reasonable 'economic decision', because the actual market share of the excluded popular distributions is in fact many times higher than CentOS installations in real world use! they would also only have to change/adapt a few lines of code in the installer script resp. minimal efforts, and everything would work at least as compatible to this other distributions as we are able to archive it now by very uncomfortable workarounds resp. unnecessary manual interventions. so it's really more a kind of attitude on BMDs side, which can hardly be euphemized as something, which doesn't seem like 'pure ignorance' to all affected linux users. yes -- i really feel a lot of sympathy for all this pragmatic needs to set priorities, and i'm really glad, that they began to support linux at all in more accessible manner, but the mentioned necessary changes are so incredible trivial and were already reported/suggested so many times by affected users, that i really do not see an excuse, why we didn't see the slightest improvement in this regard since the first beta release of resolve for linux (i.e. more than 15 months!). When we talk linux the first I think about is stability and performance!!! This could be done in a 'closed room' without telling us they even ARE ON LINUX! - Not attempting to introduce their own (off) standards, have I missed it? Thanks again Daniel for your latest deb package. I've now got resolve running quite well on Ubuntu 18.04. My testing is very basic as I'm a real Resolve beginner, but so far so good. If my problem has already been answered before, forgive me. I only get audio from AVCHD .mts files, no video. The media shows "Offline" in the Media pool and Timeline. Mp4 files do nothing. DVCPro mxf are fine. Mts and mp4 work fine on my Resolve Windows instalation, but I desperately want to get away from windows. Also wondering if its possible to buy an unlock key when the final version 15 Studio is released. Could I then just unlock the downloaded installation, or are there any extras in the boxed version. I believe the dongle is being phased out. I'm glad you got it working Neil! I actually think you need the Studio version in order to get those files to read properly. The file and codec support is a lot better. The good thing is that you used my MakeResolveDeb tool. That way, when you buy a Studio license, all you have to do is make a new Resolve Studio *.deb file and replace your existing davinci-resolve package with the davinci-resolve-studio package. Your Resolve installation will be converted to a Resolve Studio installation with settings and database intact! It doesn't matter if you get a dongle or a key. The software is the same and what you get in the box is the same as on the website. Thanks Daniel, your help in making your deb packages available is really appreciated. Thanks also to all the other members who share their knowledge here. Also to Black Magic for supplying such great software for absolutely no charge. I was along time user of Premier Pro, until they went the subscription route, and then I changed to Edius Pro. They are both good as well, but there is something special about Resolve. And now it’s on Linux!! I gotta have it. Martin Schitter wrote: it's more than implausible, to interpret this stubbornness as a reasonable 'economic decision', because the actual market share of the excluded popular distributions is in fact many times higher than CentOS installations in real world use! Bear with me, but the stubbornness seems to come from your side. CentOS support is a 'byproduct' from having RHEL support in the first place. RHEL is supported because paying customers do want enterprise distributions that come with support contracts most of the time. People who don't want to get a RHEL entitlement, still have the option of using CentOS. As it's pretty much the same to RHEL bitwise, there is no additional effort needed for BMD to support this combo. So that's apples and oranges, when you compare the market share of CentOS to other "community" or "desktop" linux derivates. linuxfreak wrote: ... the stubbornness seems to come from your side. RHEL is supported because paying customers do want enterprise distributions that come with support contracts most of the time. ... So that's apples and oranges, when you compare the market share of CentOS to other "community" or "desktop" linux derivates. if you study this kind of statistics/trends, it should look more than obvious, that those days, where RHEL/CentOS undoubtedly represented a significant option, are more or less bygone history! RHEL plays a nearly negligible role at the present day. but even, if it isn't a very popular choice anymore, i don't see any necessity to ignore or discriminate against this particular choice. if linux software is written with care, it simply should run on any kind of distribution with minimal adaptation efforts. my nvidia-docker based solution (https://gitlab.com/mash-graz/resolve) is a radical different approach/workaround to solve this challenge. it's somehow a hybrid solution, where you really use an unmodified CentOS resolve installation resp. runtime environment within an arbitrary linux host ambient. in this case, all of the CentOS specific dependencies and library versions are handled within the container in a perfectly reproducible and consistent manner. this makes it much easier, to reduce incompatibilities, trace actual bug reports and reduces the amount of necessary external installation requirements. the surrounding container hosting environment just provides the necessary general infrastructure in very compatible way. it should be better seen in analogy to running CentOS on various kinds of actual hardware. especially resolves demand of CUDA access doesn't make it easy to realize this kind of environment isolation in practice, but the developers of nvidia-docker already prepared a fantastic solution, to work around all this nividia related dependencies and driver version incompatibilities in very satisfaying and mature manner. in the meanwhile it has become the de facto standard solution for CUDA acceleration in cloud related tasks (e.g. machine learning jobs running on kubernetes clusters...). all the necessary tools to realize this kind of solution are already available for nearly any kind of linux distribution and well maintained by nvidias development team. o.k. -- it's a little more tricky on alpine and clear linux, but on the more common choices, its acceptable easy to install nvidia-docker, although not utterly trivial. nevertheless i still have my doubts, if it's really an acceptable solution to the given problem or if daniels approach, to simply repack .deb packages, isn't a more satisfaying solution for the affected actual debian/ubuntu/mint users? in fact, it would be very easy for me, to add this kind of debian repacking into the actual CI solution, just the same as it's now generating the docker images automatically. i often use this kind of private debian packaging and deployment via aptly based private repositories hosted on GitLab pages in my inhouse work as well. it's a really nice and user friendly solution, to provide all the necessary update requirements in very comfortable and debian-like manner, but in this particular case, i don't think, it would be adequate. i simply do not see any reliable way, to test and avoid all the possible incompatibilities in a sufficient manner in the given case. simple repacking of complex binary applications should be IMHO only seen as the last resort, if no other passable alternative is available. it can not substitute proper adaption and CI handled compilation/generation of perfect fitting packages for the most relevant target platforms/distributions. that's why i have precautionary chosen this other approach in this particular case, which undoubtedly also has it's drawbacks and uncomfortable/frightening complexity, but it seems to provide at least a little bit more control and robustness concerning all the mentioned well know obstacles and show stoppers. saaguero wrote: I'm having problems with sound support, no sound at all. Nice statistics about *web servers*. Who doing high end video editing/grading would at the same time expose the same machine to the internet - and publish it as a web server!!! So BMD could increase the their available Linux platforms from 16.9% to 78.2% = 460% just by adding a .deb installation! The Linux port is still rinky-dink. They use CentOS out of convenience, as Resolve ran originally on RHEL. There's a host of questionable solutions, many inherited by BMD from the DavSys base. Opening the port beyond the turnkey system has exposed these shortcomings and it looks less than pretty. For sure, the software and the port are welcome, but that hardly excuses all the issues that come with it. BMD's been lax in fixing the issues that have been reported many times over, so this convo is a bit Groundhog Day. We keep hoping for (more) fixes on every release and keep pointing issues out, because a more wholesome Linux port is better for all. A point can be made that Resolve is usable on Linux, but at the same time, the current port is barely sufficient. After b3 removal and b4 clean install, I've got persistent Segmentation Fault after Resolve start on my Ubuntu 16.04 with GTX1070. After dancing with strace and logs, I've installed Cuda developer package as described here https://developer.nvidia.com/cuda-downl ... rch=x86_64 . Now I can start Resolve with no problem. May be someone find this info helpful.